This blue marble polished acrylic plate is paired with a cherry finish plaque for a traditional looking corporate award. 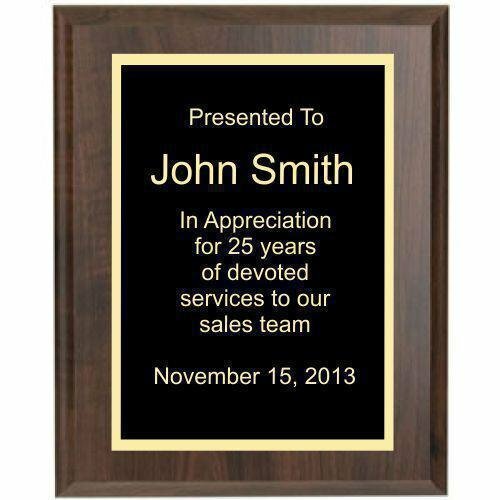 The plate is 1/8" thick and adheres to the plaque with a bright white double faced tape to make your personalization really stand out on this classic award design. If you are looking for something different in glass awards then these Gold Chroma Acrylic Plaques are just what you are looking for. This unique product features an elegant design that frames whatever personalization requirements you may have and can either be sandblasted or lasered directly on the front. The product includes an easel back so it can sit on a desk Available in three different sizes 6 1/2" X 8 1/2", 7 3/4" X 9 3/4" or 8 3/4" X 11 3/4" and three different finishes Gold, Sienna, and Rust gives you plenty of flexibility for your award needs. These items are packed in a standard white box that can also be used when presenting the award.